Want a Better Checkup? Ask How From A Dentist in Mesquite! Do you love that slick, smooth, minty-fresh feeling you get after your dental cleanings? Unfortunately, it can be hard to maintain that super-clean feeling on your own! The good news is that there’s a lot of information and tools out there to help you take excellent care of your teeth and gums at home. A dentist in Mesquite talks about simple, straightforward ways to keep your mouth clean and healthy. You’ll be on your way to better oral health (and better checkups) in no time. How Can a Great Homecare Routine Help You? Fewer Cavities – You won’t have to come back after exams for as much dental work. Aesthetics – With thorough brushing and flossing, you’ll reduce staining, polish your teeth and help your smile shine its brightest. Not to mention that your crowns, bridges and existing fillings will potentially last longer. You can think of your dental work the same way you think of a set of car tires: it has a certain life to it and then things need to be replaced due to wear-and-tear. By keeping things clean at home on a daily basis, you can extend the life of all the dental work you’ve invested in. What Should You Be Doing at Home? Now that the benefits of good homecare are clear, you’ll be glad to know that an effective routine is easier than you might have guessed. 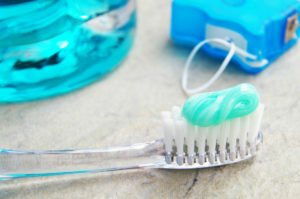 The basic guideline is brushing at least twice per day and flossing once. Use a soft-bristled brush and be sure to brush for two minutes. It’s important to angle your bristles at a 45-degree angle towards your gumline and use short, gentle horizontal strokes. Next, hold the brush vertically to reach the back surfaces of your teeth. There’s no question that an electric toothbrush will do a better job cleaning your teeth. With anywhere from 6,000 to 30,000 brush strokes a minute, and the fact that they automatically stay on for two minutes, they provide superior cleaning. There are brushes at many different price points so there’s one for every budget. While most people feel that they do reasonably well with brushing, flossing is another issue altogether! While it’s ideal to floss at night before bed, that can also be the hardest time of day because you’re the most fatigued. Try flossing right after dinner, or a couple of hours before bed when you’ll have a lot more energy for it. As for other tools, the waterpik or a showerpik can be really helpful. It doesn’t take the place of floss, but it can be great for people with extensive bridgework or who have gum disease and “deep pockets.” Even flossing with great technique doesn’t always reach the bottom of those pockets, and the flushing action from the waterpik can have a better shot at cleaning those nooks and crannies. Dr. Byron McKnight is a distinguished general, restorative and cosmetic dentist in Mesquite who consistently goes the extra mile to make sure his patients receive outstanding and comfortable dental care. He places a high value on educating his patients so they can take great care of their teeth at home and enjoys helping them prevent dental problems from the start. He can be contacted for questions through his website or at (972) 698-8000. Comments Off on Want a Better Checkup? Ask How From A Dentist in Mesquite!